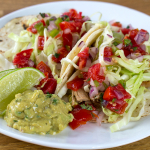 Turn leftover pot roast into pork street tacos for a fast Mexican food recipe the whole family will love. Toss the shredded cabbage with the onion, lime juice, and sea salt. Set aside. Warm tortillas over a gas flame or in the microwave. Shred the pork and chop into 2″ strips. Once the tortilla is heated, spread 1 TBSP of creamy guacamole across the center of the tortilla. Add two fingers’ worth of meat on top of the guacamole. Add two fingers’ of the shredded cabbage mix on top of the meat. Add 1 TBSP of pico de gallo to top each taco.